On the exposed brick wall of The Capilano Tea House and Botanical Soda Company hangs a beautiful weaving. Woven by Squamish First Nations Chief Janice George and her husband Willard Joseph, the weaving blesses this new tea house located in Vancouver’s historic Gastown. The red in the weaving symbolizes owners Michelle and Paisley Nahanee’s connection to the Squamish First Nations. The pyramid pattern represents the mountains, not only of the North Shore but also the mountains around the world where tea is grown. The green represents the botanicals and teas used in their unique and delicious blends. “So even though we’re here in Vancouver and doing our business away from our community, the weaving connects us,” says Michelle. The tea menu at The Capilano is small – just ten blends – but reflects the global meets local approach Michelle brings to her work. The blends include sacred indigenous botanicals like stinging nettle, lavender, chamomile, juniper, and sage. They’re artfully combined with botanicals from around the world: hibiscus, sumac, citrus peel, cardamom, ginger and cinnamon. Some blends are rooibos-based, and there’s organic Mao Jian green tea and black tea in the blends too. I sampled four teas. The first, The Sisters, contains lavender, chamomile and rose hip. The tea has a natural sweetness, with floral and subtle spicy notes, with a smooth finish. “This tea is about peace,” says Michelle. The Warm Grey is The Capilano’s take on the traditional Earl Grey Tea. Their version is fragrant with bergamot and lavender. The tea is full-bodied with a pleasantly mild astringent finish. A local ice cream company is using this blend in one of their ice cream flavors. The Juniper Rooibos is exceptional and it’s one of their best sellers for good reason. It’s a blend of rooibos, rose petals, lavender, blueberries and juniper berries. The juniper berries add a tart, piney flavor and the hints of citrus provide a counterbalance to the woodiness of the rooibos. The rose petals, lavender and blueberries add a sweet layer. This blend is alchemic: I was convinced there was vanilla in the blend. My favorite was the Weaver’s Blend. Inspired by Chief Janice George, it has just three ingredients: sage, a mild black tea from Southern India, and blackberry leaf. The aroma of the dry leaf is astounding, and it translates into the cup-it’s a little sweet, a little tart, a little floral and very spicy. The blackberry leaf boosts the robustness of the mild black tea. It’s a good tea to drink while working-or weaving for that matter! The food menu, for now, is small. I had the bannock, a simple scone-like bread that can be either fried or baked. This version, made by Turtle Island Catering, is made with coconut oil, rather than the traditional lard, so it’s perfect for vegans. It’s served warm with a wonderful rhubarb/bergamot infused butter created by the Local Churn and a tart juniper and currant jam made by East Van Jam. Capilano just recently opened their storefront space in Gastown. 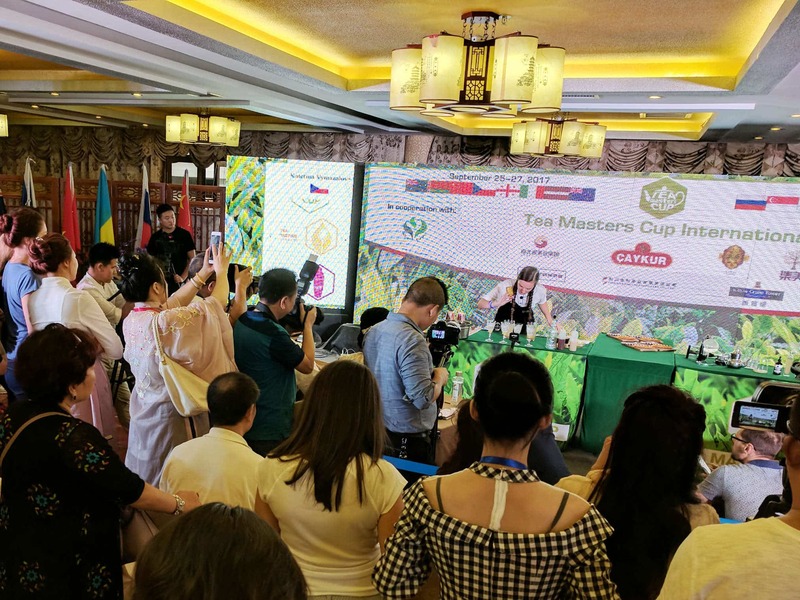 For the past several months, Michelle and Paisley operated pop ups in the Lower Mainland and introduced their teas to a wider audience at the Vancouver Tea Festival. It’s a good fit: Gastown is a historic, eclectic and colorful neighborhood that’s a bit touristy too. The new space is warm and inviting: rocks and sticks from the Capilano River sit in the front window. Renovations exposed a brick wall, a window (which now frames a “tea” sign), and a doorway that’s now a shelf for cups and saucers. Chief Janice George gave them cedar root baskets and crafts to decorate the space. There’s a woven tea cup and saucer in perfect condition, a testament to the fine skill of the woman who created it 100 years ago. As a First Nations entrepreneur, Michelle feels a unique obligation. “We’re out in business world, but we’re also representing our family, our culture, our traditional names, and we’re expected to carry ourselves in a good way and that influences us,” she notes.